The latest addition to the 1073 family is a variation called the 1073N. 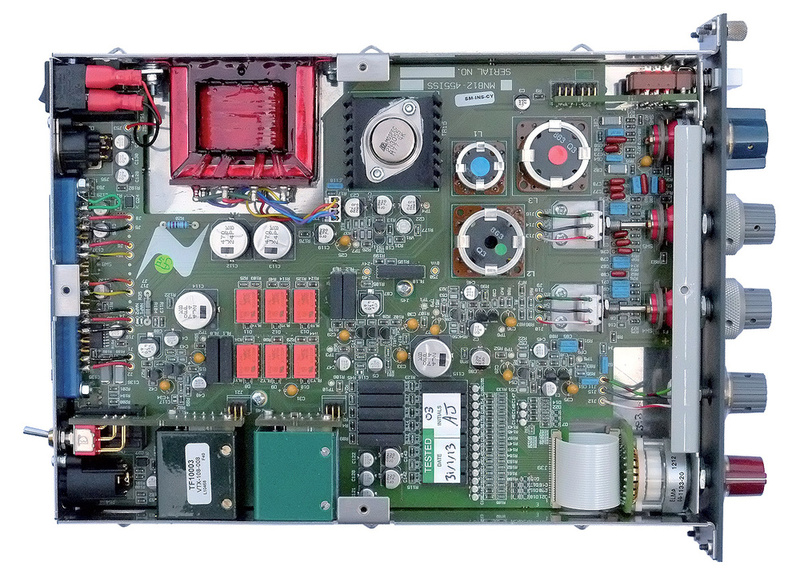 In essence, this is a reworked version which maintains the same '45-series' form factor and console connectivity, with the same front-panel controls and circuitry, but employs modern construction techniques and some surface-mount components, to improve the packaging and allow the addition of some new features and connectivity. The end result is a backwards-compatible 1073 module that can also be used as a stand-alone preamp/EQ. On the rear of the module, you can see the Amphenol connector that enables this device to be used with original Neve 45-series consoles, in addition to being suitable for stand-alone use. The 1073N is identical in size and nearly as heavy as a standard 1073 console module, and it's supplied in a black-painted steel sleeve, to give it a more 'complete' and stand-alone look. Getting the unit out of and back into the sleeve is a bit of a challenge, because there are no side rails or guides, and there's an anti-vibration plate part-way down on the inside of the lid. Bizarrely, even when the unit is inside the sleeve, the rear toggle switches all stand proud — the sleeve provides no protection at all! The external power supply is a compact, third-party, 'line-lump', switched-mode unit, which provides 0.31A at 48VDC. The mains input to the 'line-lump' takes the form of a standard IEC inlet, and it accepts any supply voltage between 100V and 240V AC. Sadly, there's no cord-retention or locking mechanism, but there is a fuse-holder, a blue power LED, and an on-off rocker switch, all on the module's back panel. Alongside the original 18-way Amphenol edge connector, which still functions as normal if the module is placed in a rack or console, Neve's designers have squeezed in a male XLR to carry the balanced output, a Combo XLR for the balanced mic and line inputs, and a quarter-inch TS socket for an unbalanced instrument input. A phantom-power slide-switch, with red LED, and a mic input-impedance toggle switch are arranged around the Combo XLR connector. In addition, four miniature toggle switches configure the DI input with a 20dB pad and ground lift, and switch the module between the console/rack and stand-alone operating modes, setting the correct output termination and external level-control options. A three-pin Sleeve socket is secretively assigned for 'future expansion', but I would hazard a guess that this might be for connecting a yet-to-be-released remote fader module. The innards of the 1073N module are housed almost entirely on a single PCB, with most passive components being surface-mount devices. The original Carnhill output transformer (top) and the mic and line input transformers (bottom) are present, along with the large EQ inductors (right). The array of black rectangles (bottom centre) are the sealed relays that provide the gain switching, and the groups of three small, black, D-shaped devices are the five transistor gain stages. 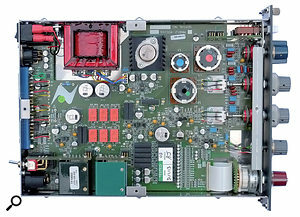 The output stage replaces one of the small signal transistors with the large, lozenge-shaped 3055 output transistor mounted on a heat sink adjacent to the output transformer.Internally, the 1073N employs a single, main printed circuit board (PCB) which carries pretty much everything. Most of the passive components are surface-mount types, which helps to create the space needed to accommodate the additional features, but all the transistors are conventionally sized. The EQ section retains the traditional wound inductors, and three Carnhill input and output transformers are also included. The front-panel Grayhill switches are simpler than those in the original module, with the signal switching now performed by sealed relays on the PCB, rather than through complex hand-wiring around multi-layered switches. Overall, though, the audio circuitry is a faithful reproduction of the original design, in all its single-sided, five gain-stage, Class-A glory! In its rack/console mode, the 1073N picks up the required single-sided 24VDC power rail for its circuitry from the Amphenol connector, along with its inputs and outputs, and phantom power is supplied directly to the XLR connectors on the console or rack. In its stand-alone mode, the 24V rail is derived from the external 48V power unit, which also provides phantom to the built-in XLR connector. The front panel is pure classic Neve, with the clear white control legends printed in horizontal alignment on battleship-grey paint. A 22-way red wing-knob switch sets the input sensitivity in 5dB steps from -20 to -80dBu on the left-hand side for the mic input, and from +10 to -20dBu on the right-hand side for the line input. The mic and line inputs each have their own transformer, while the instrument input interrupts the mic signal path. Three fluted grey knobs set the gain for each section of the three-band EQ, with ±16dB available on the high and low shelf sections, and ±18dB on the mid-section. The high shelf has a fixed turnover frequency of 12kHz, but the LF turnover can be switched between 220, 110, 60, 35Hz and Off (bypassing that band) using the outer aluminium knob of the concentric rotary switch. A similar concentric switch sets the centre frequency of the mid-section, with options of 7.2, 4.8, 3.2, 1.6, 0.7 and 0.36 kHz, or Off (band bypass). A blue wing-knob rotary switch to the right of the module adjusts the turnover of an 18dB/octave high-pass filter, with options of 300, 160, 80, and 50 Hz, or Off (bypass). Finally, two white push-buttons switch the entire EQ section in or out of circuit, and flip the polarity of the output. 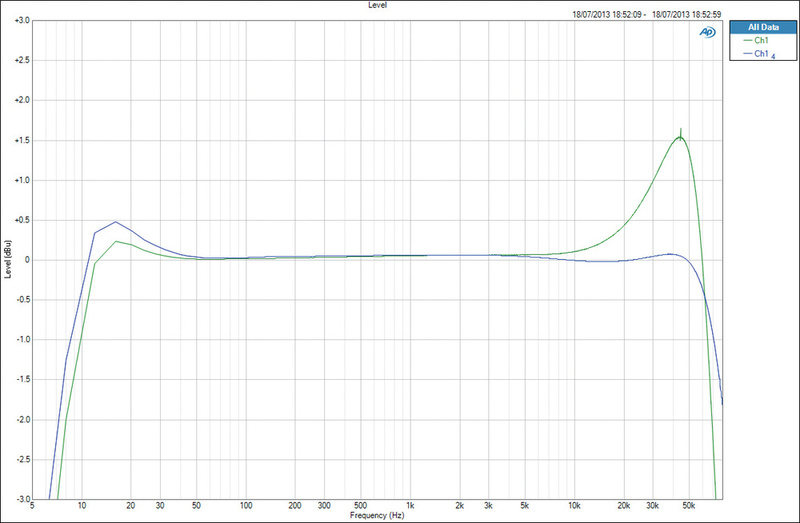 The overall frequency responses for a mic input with 50dB gain (green), and line input at 0dB gain (blue). Note the greatly expanded amplitude axis, which exaggerates the 'bass bump' and HF resonance due to the input transformers. The -3dB points are around 6Hz and 75kHz for both, and flat within 0.5dB between 20Hz and 20kHz. As a stand-alone, single-channel preamp/EQ, the 1073N does everything expected of it. There's a huge amount of gain available, thanks to the five separate transistor gain stages in the 1073 circuit, and the EQ is as flexible and musical as ever. A rear-panel toggle reconfigures the mic transformer's two primaries in series or parallel to provide nominal impedances of either 300Ω or 1.2kΩ, and if phantom power is required it must be selected with the recessed slide switch below the XLR connector. The use of a Combo XLR makes it impossible to have mic and line inputs connected simultaneously, but the line input has a standard 10kΩ input impedance and is via a transformer (so is floating and ground free). Inserting a TS plug into the DI input automatically overrides the mic signal path, post transformer, and the sensitivity is set with the mic side of the input gain switch. With the rear-panel pad toggle set to 0dB, the input impedance is about 1MΩ, falling to just 10kΩ when switched to -20dB. The lower impedance shouldn't be an issue, since only active guitars and basses are likely to require the 20dB pad position anyway. A second toggle provides a ground-lift mode for the DI input only (the balanced mic and line inputs are ground-free, thanks to their input transformers). In the 1073's standard console installation, the corresponding channel fader is wired into circuit just before the output driver stage, with the signal out and back passing through the Amphenol edge connector. Clearly, that's not appropriate for a stand-alone module, so another rear-panel toggle (marked Ext Lvl Ctrl) bypasses that external connection path, and routes the signal straight from the EQ stage to the output driver, at unity gain. An associated switch introduces a 5kΩ termination to ensure a flat frequency response when there is no external fader. A chart showing the available EQ responses at maximum/minimum gains. The four green traces show the HPF options, while the eight orange curves are for the bass shelf section in boost and cut modes at the four frequency options. The 12 red curves are the mid-range peaking equaliser at the six different centre frequencies, while the two purple curves illustrate the single-frequency HF shelf. In choosing to maintain full backwards compatibility with the 45-series consoles and racks, AMS-Neve have inevitably compromised the 1073N's operational ergonomics, but I doubt that will put off devotees. More likely to upset the real Neve fan base, perhaps, is the use of modern manufacturing techniques — the plug-in amplifier and EQ section cards, complex multi-layered switches, and lovingly hand-wired and neatly laced cable looms just aren't financially viable techniques any more. Theoretically, the relay-switched gain staging and the more optimal placement of gain stages with circuit functions should result in improved technical performance… but state-of-the-art specifications was never really what the 1073 was about. Yes, it set high standards for its day, but it wasn't long before others set even higher technical standards. What others didn't do quite so easily was to make something as musically satisfying, and that's why the 1073 maintains its reputation as "the world's most desirable preamp”. Neve's 1073, 1081 and 1084 modules formed an important part of my early broadcast audio education, and I still think of the dual-concentric EQ knobs and the split mic/line gain knob as the definitively correct way of building and operating a preamp/EQ module: the ergonomics and intuitiveness are just so perfect! The switches and pots on the 1073N all feel great — solid, reliable, nicely weighted and professional. The rear-panel switches, while not ergonomically ideal, are reasonably accessible and do the job well enough, but I remain a little nervous about the lack of security for the coaxial power connector. The only practical purpose of the metal sleeve appears to be to bear the company name in bold letters, and that's a great shame and a missed opportunity when it could have provided protection for the rear toggle switches, and a means of securing the coaxial power input. It could even have been fitted with a handle for extra convenience! As it stands, there aren't even any rubber feet to prevent scratching other units! Moving on to the sound quality, to my ears the 1073N sounds just as good as the original 1073, with its generous headroom margins, transformer richness, ample gain, and musical EQ. The addition of a fader would allow the circuitry to be pushed and abused in a way that isn't very easy in its stand-alone mode... but I have a sneaking suspicion about that possibility, as I mentioned earlier. Re-engineering the 1073 module to be usable in a stand-alone context is a clever idea, and it has been implemented quite nicely. As a result, the 1073N will appeal to those whose pockets aren't quite deep enough to afford multiple classic 1073 modules and a rack to house them all at the same time. The fact that the 1073N provides a useful instrument input — not available on the standard module — adds to its attractiveness, and the cherry on top is that, should the piggy bank swell to afford a dual-preamp setup, the 1073N can be installed in a standard rack too. The best of all worlds? Yes, quite probably. With the review 1073N's microphone input impedance switch in the 1.2kΩ position, the actual impedance was 1.3kΩ for all sensitivity settings between -20 and 50 dB. However, it fell to 910Ω for all settings between 55 and 80 dB. At the 300Ω setting, it remained close to that value regardless of the input sensitivity. With high input levels, the input transformer could be heard to 'sing' acoustically, but this shouldn't be an issue in practice. The maximum gain through the 1073N via the mic input measured +78dB, and the minimum was 18dB — all gain steps measured within 1.5dB of the marked settings. The output clipped at +28dBu, and the maximum accepted input signal level (at the minimum 20dB mic gain setting) was +10dBu. The microphone EIN figure for a 100Ω source measured -127dB at both the 50dB and 80dB settings (an additional gain stage is introduced for gain settings above 50dB). 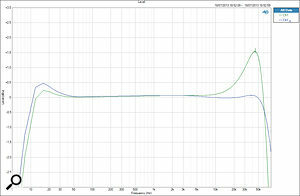 For the line input, the minimum gain was -9dB and the maximum 21dB, with a maximum acceptable input level of over +30dBu! The signal-to-noise ratio for the line input was 93dB (ref. +4dBu output), giving a total dynamic range of around 1171dB. 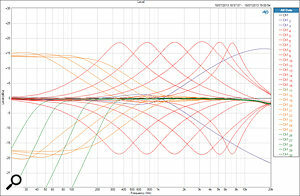 THD+N for the line input with a +4dBu output measured 0.003% (-89dB), with the third harmonic as the dominant component. The bandwidth measured via the line input had -3dB points at around 6Hz and 85kHz, with a small +0.5dB 'bass bump' centred at 15Hz. Measured via the mic input at 50dB gain, the -3dB points closed in slightly to 7Hz and 75kHz, the 'bass bump' reduced to just 0.25dB, and a transformer HF resonance appeared at 45kHz, reaching +1.5dB. The preamp was phase correct from all inputs to the output, unless the polarity switch was engaged. The instrument input exhibited the same gain structure as the microphone input — so 20dB of gain at the minimum mic sensitivity. 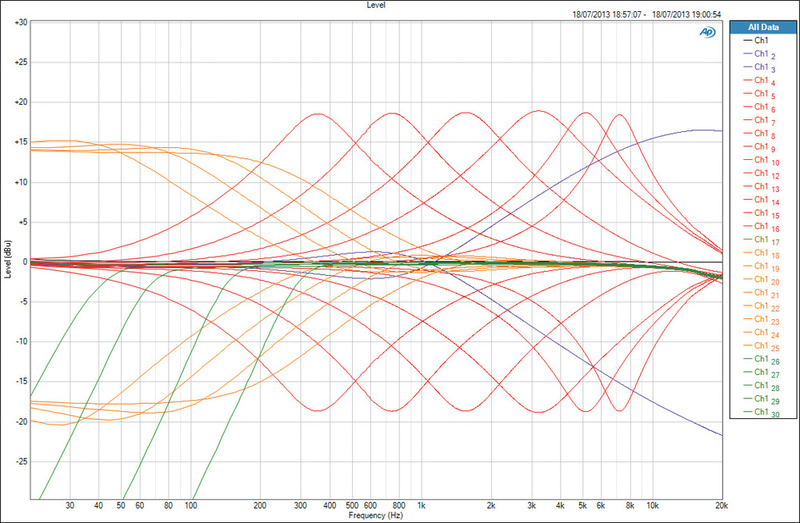 Since there is no transformer in the input signal path, the bandwidth was ruler flat from 10Hz to beyond 80kHz. It's a full 1073 mic preamp and EQ, with stand-alone capability and full backwards compatibility! A successful combination of modern construction techniques with original transformers, inductors and transistors. Potential for future expansion (hopefully easy external fader integration!). The DC power connector is not latching or retained. Combo XLR means that only one source format can be connected at a time. This is another useful update to Neve's classic 1073 console module, and it should appeal to anyone wanting the flexibility to take it on the road or connect to the original Neve 45-series racks/consoles. The signal path is identical to the original, with the addition of an instrument input. AMS Neve +44 (0)1282 457011.